The World According To Humphrey! 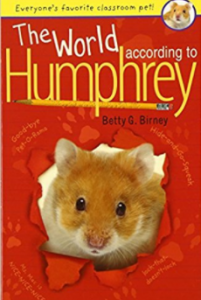 In this book called The World According to Humphrey, by Betty G. Birney. There was this teacher named, Mrs. Mac. She wanted a class pet, so she went to Pet-O-Rama. She found a hamster and she fell in love with it, she had to take it home. So she told the pet owner, I want this hamster. So she bought the hamster. She name the hamster, Humphrey. She brought the hamster to school that day, all the kids also liked Humphrey, after school every day Mrs. Mac, took Humphrey home, and oh the advenchers Humphrey had. Summary – One day Humphrey’s life would change. One day Mrs. Mac said that she was going to leave the class forever. All the classmates were sad even Humphrey, because he know he could not go with Mrs. Mac. the next day Mrs. Mac brought Humphrey to school and then left, and there was another teacher named Mrs. Brisbane, and she was mean. At the end of the day, Mrs. Brisbane did not even take humphrey home. So Humphrey was left alone, in room 26. Than the light came on and in came a man named Aldo. Little did he know it, later he and Aldo would become buddies. On Wednesday, the same thing happened, Mrs. Brisbane didn’t take Humphrey home. Finally it was Friday, and Humphrey was really worried. What if he had to stay in the classroom for 2 WHOLE DAYS! Gratefully some parent teachers came in and said they were worried, that if Humphrey was left here for 2 whole days, he might not live. So it was settled, he was going to get taken home this weekend, but the parents were not done. They said that if the teacher couldn’t take him home (because the teacher couldn’t) that the kids and their parents would take turns bringing Humphrey home, but either of the parents couldn’t take Humphrey this weekend, but could take him next week. This was bad news for Humphrey, would he have a home to stay in this weekend? Thankfully the principle was there, and he could take Humphrey home. Humphrey felt very proud. He was going home with the most important person in the school. On the way home, the principle seemed very excited to have Humphrey come home with him. At home humphrey realized that the principles own kids didn’t obey him??? Everyone at school did, but his own kids didn’t that just didn’t make any sense. If anything it should be the other way around. Humphrey knew what he had to do. So he attempted to make the principles own kids obey him. By the end of the weekend his kids were obeying him almost as well as the students did! Little did Humphrey know this kind of skill was going to be helpful in the later weekends he had. Weekends past and he used the skill a lot more than he thought he would. But no,matter what he never forgot Mrs. Mac! Finally the last weeked were the holidays. Mr. Brisbane was able to take humphrey home, but he warned him that this was probably, not going to be a fun Holiday. He said that it wasn’t fun since his wife, got run over by a car. When they were finally home, Humphrey saw the grumpy wife. He now also thought this would not be a fun holiday. But then his opportunity came, he could make Mrs. Brisbane not grumpy and playful! So he got out of his cage and squeaked catch me if you can! So Mrs. Brisbane saw and started rolling in her wheelchair and saying, “ You can’t outsmart me.” But Humphrey cept on running his little heart out. Up until Mr. Brisbane came through the door. Than Humphrey went up to his cage and locked himself back up. Mr. Brisbane came in and saw his wife a;l; red and smiling, so he asked her, “ What happened.” So Mrs. Brisbane tolled him the whole story. Then the rest of the story was so smooth, and the rest of the holidays was very fun. Mrs. Brisbane and Mr. Brisbane even made humphrey an obstacle course, and Humphrey loved it! I think the author’s message is that if you think that you are the only species that can change the world than you are wrong. One exadence is that on all of the vistes to all the families he helped them with one thing, and that thing, changed their lives forever. I recommend that you read this book, because it is fun and entertaining, and maybe you have an interaction to the book!